Good morning, everyone! I’m excited to be sharing my first blog post for the Altenew Blog. 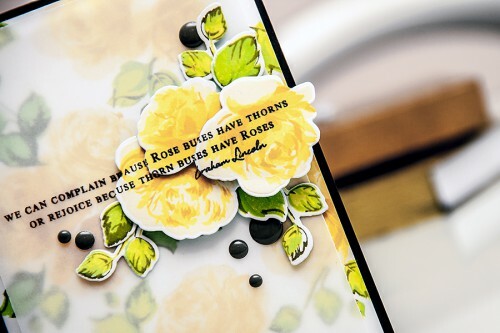 Like many of you I’m absolutely fascinated by the gorgeous Vintage Roses stamp set. Up until the moment I saw them for the first time last year I had no idea that something like this can be done by simply stamping images on top of each other using various colors of ink. Pure magic! I was intrigued and very eager to give this stamp set a try. The result is fabulous! I was able to easily create the card shown above using two stamp set, a set of matching dies, some cardstock, vellum, enamel dots and a few colors of ink. I not only stamped a background for this project which resembles patterned paper, but also created matching embellishments using coordinating dies. Easy! I used a sheet of vellum to mute the background a bit and help my stamped and die cut roses stand out from the background a bit better. I first used it on vellum at the beginning of January, than I went to CHA and it was dry after that, lol (thats about 2 weeks later)! No idea how long it really takes. Its such a rich ink that I just couldn’t resist using it. Don’t have the patience to wait so I emboss mine. 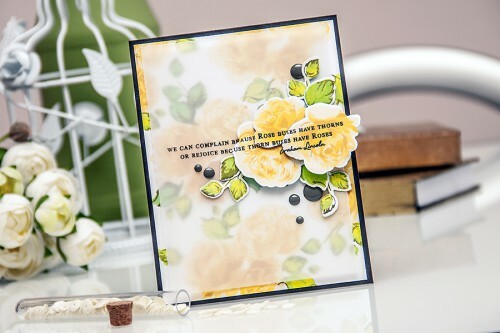 Stamping on the roses is a wonderful idea and will certainly try it. Love this stamp set and pleased that there are now dies to go with it. Gorgeous, Yana. I so appreciate your videos! Love Altnew too! This card is really beautiful!! I don’t usually use the color yellow, but it is so pretty and Spring-like!! Thank you for your inspiration!! I look forward to your blog!! thank you so much! Yellow is probably one of my fav colors. Just wanted to come and tell here also that you totally made this perfect in every way. Your video was very pleasant to watch, very well edited and I am so jealous of your English speaking skills. 🙂 I’ve been working with my videos too and the audios are so killing me. Good job! thank you so so much, Marika! Comments like yours are so appreciated! I’m off to check your blog! Hugs! 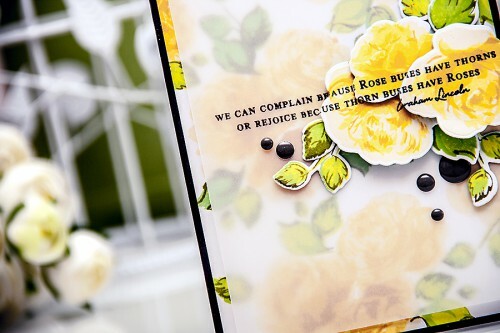 Love your card, especially how you stamped the words on the roses. Brilliant. I have a question. What type of adhesive do you use for the vellum? thank you so much, Pam! I think it was my regular adhesive. I didn’t worry about using a special kind (and to be honest I do not even have any on hand) as it was hidden behind the roses. The rest of vellum is not adhered and is just floating on my card. I love to create my own backgrounds too, but this is so fresh looking with all this yellow. Very inviting, any recipient would smile. Thank you as always for your videos and sharing your expertise.